Each week, thoroughly clean cabinets using simple soap and water. Avoid caustic cleaning material. Clean condenser coils regularly – the exact frequency of the cleanings will depend on your kitchen environment and the immediate area surrounding your reach-in cooler or reach-in freezer. In some cases, weekly cleanings will be necessary. Regularly check the gaskets to ensure a proper seal forms around the door of your reach-in cooler or reach-in freezer. Depending on your municipality, some reach-in coolers and reach-in freezers are eligible for rebates from various utility companies and other governing bodies. One Fat Frog Restaurant Equipment welcomes quick cash deals and package deals towards all used reach-in coolers and reach-in freezers. Someone on the One Fat Frog Restaurant Equipment sales staff can help you pick out the proper used reach-in cooler or reach-in freezer for your restaurant. 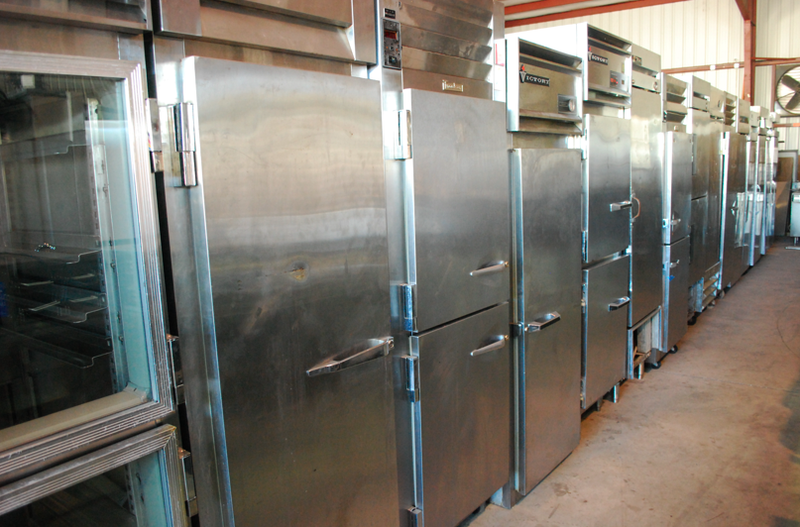 One Fat Frog Restaurant Equipment can also get you financed for all of the used commercial restaurant equipment you need – including reach-in coolers and reach-in freezers. Come by One Fat Frog Restaurant Equipment today!